The beautiful tropical island of O'ahu is filled with predators, from high-flying owls to bottom-dwelling criminals. 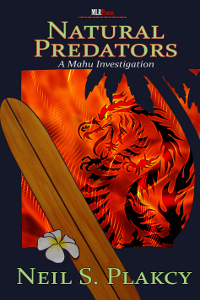 When the body of an island patrician is found in a warehouse fire, tracking his killers will bring openly gay Honolulu homicide detective Kimo Kanapa'aka into contact with many of those predators, natural and otherwise. Kimo and his detective partner Ray Donne dig deep into the history of Hawai'i as the islands were teetering on the brink of statehood in order to understand the victim, his killer, and their motives. Kimo and his partner, fire investigator Mike Riccardi, decide to become foster parents for a homeless teen who witnessed the crime, while preparing to become dads themselves.